Over one hundred years ago, Sanjiro Miyoshi was born on February 28, 1915 in Wakayama, Japan. His American Story began when he arrived in Tacoma, Washington, on a ship called the SS Brema that came to the United States from Victoria, British Columbia to start a new life with his wife and four children. On January 24, 1942, the FBI issued a warrant for his arrest. By February 2, he was apprehended from his home at 111 Scranton Road, Terminal Island, California because he used a short wave radio that was confiscated. Sajiro was sent to Tuna Canyon Detention Station. By June 10, 1942, he was moved to Fort Lincoln, Bismarck, North Dakota. 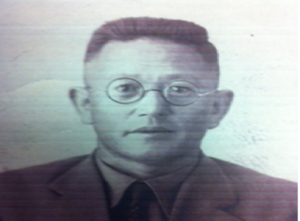 He was later released from there in July and reunited with the family in Manzanar Concentration Camp. Later he moved to Grand Junction, Colorado on December 8, 1944. He passed away on June 9, 2001 during a trip to Japan at the age of 86. This story was passed to us from his daughter, Kristin Okimoto, who lives in San Jose, California, where she is member of the Board of Directors at the Japanese American Museum of San Jose.